Having lost a son and a lover, Morgan continues on her quest to destroy King Arthur. With Guinevere on the scene, she is patient and cunning and plants the seeds of jealousy. But Mordred, Arthur’s illegitimate child, who has the dark powers of the Otherworld, is also restless for his father’s crown. If you enjoy Arthurian fantasy and medieval romance you will love this final book in the Morgan trilogy. 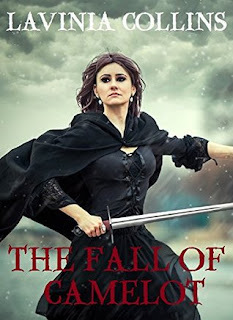 The Fall Of Camelot is the last volume in The Morgan Trilogy, and the most thrilling. The story is finally coming to its conclusion. Eager for revenge, Morgan plots with Mordred, King Arthur's son, to bring about her half-brother downfall. But not everything goes as planned, and soon Morgan realises that Mordred is not as easy to control as she had thought. War is looming on the horizon, and many will die in it. The world she knows is about to change forever. It's quickly changing throughout the book. Everything that was good in it quickly disappears, leaving only chaos and death in its place. Plots, lies, betrayals, all the ugliness comes to the surface, forcing the protagonists to come to terms with their actions. To face their inner truths. To admit what they'd rather keep hidden. To grow up. To make amends. To grieve and forgive. Even though you know what is going to happen next (at least you will if you're familiar with the Arthurian legends), you still won't be able to put this book down till you reach the last page. It's so gripping and enthralling. A real page turner. And a must read for all fans of Morgan Le Fay, King Arthur, Sir Kay, and the lost world of Camelot. The last book in the Morgan trilogy, The Fall Of Camelot is a dark, gripping tale of love and betrayal, intrigues and death, loss and forgiveness. Beautifully written, you won't be able to put it down. Disclaimer: this book was sent by PR for consideration. In addition, this post contains affiliate links. History geek, avid reader and art lover. Here you will find random bits of history, book reviews and musings on art, literature, manners, life, music and anything else that interests me.